Surround sound is a term used to describe a type of audio output in which the sound appears to “surround the listener” by 360 degrees – that is, the technology gives the impression that sounds are coming from all possible directions. Surround sound is a way to provide a more realistic and engaging experience. All technical aspects aside, surround sound works because multiple audio channels are received through speakers that are positioned at various locations in the room. This is programmed into the source and the sound tracks are decoded when the source is played. The main component of a surround sound setup is a multi channel or digital coaxial/optical audio decoder. Using a DVD/HVD movie, the audio is encoded when the DVD/HVD is produced by packing multiple audio channels into a compressed format for storage. When you play the DVD movie, your DVD player or A/V receiver (commonly called a home theatre receiver) decodes the encoding scheme (i.e. Dolby Pro Logic II or DTS for example). 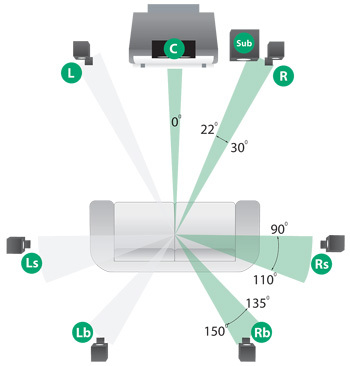 Decoding capabilities of an A/V receiver are built in. Most A/V receivers today can decode Dolby Digital and Digital Theater Sound (DTS) (DTS channel usually a coaxial or optical audio channel. It is a single channel digital pin that multiplexed with several channel. The decoder decodes the DTS sound from single channel to multiple channels), while higher-end receivers may also include DTS-ES or THX Surround. 5.1 Surround sound systems are one of the widely used surround sound setup in home theater systems. Usually- Dolby Digital and DTS encoded in a DVD are 5.1 channel audio formats. 5.1 surround sound technologies produces five channels of sound in the left, right, center, left-surround and right-surround positions. These five channels are the minimum required to produce 5.1 surround sounds. The dot decimal (.1) represents the channel for LFE (low frequency effects), which is usually sent to a subwoofer. Other 5 units are capable for handling the frequency range except low frequency(Usually they are capable of handling the frequency range from 100Hz to 22Khz and no need for any other higher frequency component like tweeter). These five units are usually called satellite units. The arrangements of a 5.1 surround sound setup shown in the picture below. 7.1 channel audio systems is the modified version of 6.1 channel and also provide more realistic experience than 6.1 setup. In this system splits the single rear-center speaker into individual left- and right-rear surround. These systems are not a true discrete 7.1 channel system as 7.1 formats don’t currently exist. 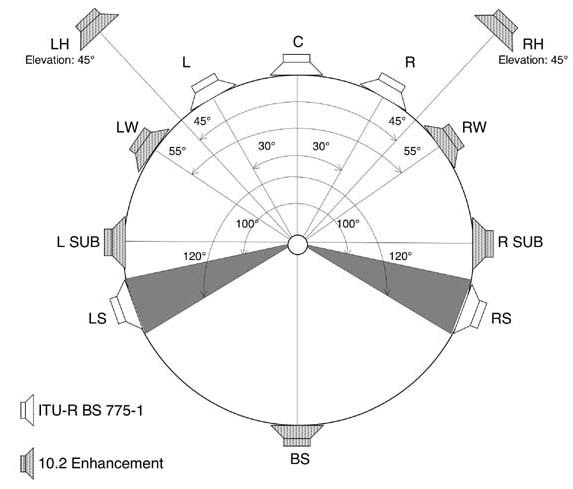 In a true discrete 6.1 surround system, the back center surround position is separate from the surround left (SL) and surround right (SR) positions. A 7.1 channel system uses matrixes extended surround where the left-back and right-back (rear-center surround) multichannel are blended together and stored. The structure of a 7.1 setup is given in the Picture below.